Vladimir Putin’s presidency will last until 2024 – longer than most other Russian or Soviet leaders ruled. This Policy Note provides a brief review of past economic developments and reform attempts. 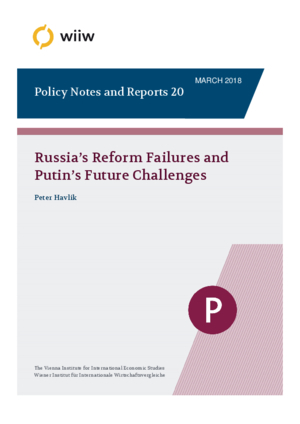 We argue that past reforms have in effect failed yet the main economic challenges currently facing Russia remain essentially the same as two decades ago: excessive dependence on energy, lack of diversification, poor investment climate, corruption, etc. What has changed is the resort to assertive behaviour and inward-looking economic policies which replaced the European integration vector prevalent at the beginning of the 2000s. We argue that without normalisation of external relations, there will be no breakthrough in the vicious circle of sanctions, protectionism, and lack of investments and economic integration. Otherwise, Russia will likely face not only economic stagnation, but even the risk of economically falling behind the peers in the East, South and West – ultimately endangering the social and eventually even political stability at home and in the neighbourhood.